Curator, Francis Mallett, giving introductory talk about the show. Painter, Louise Courtnell, demonstrating tonal painting technique. 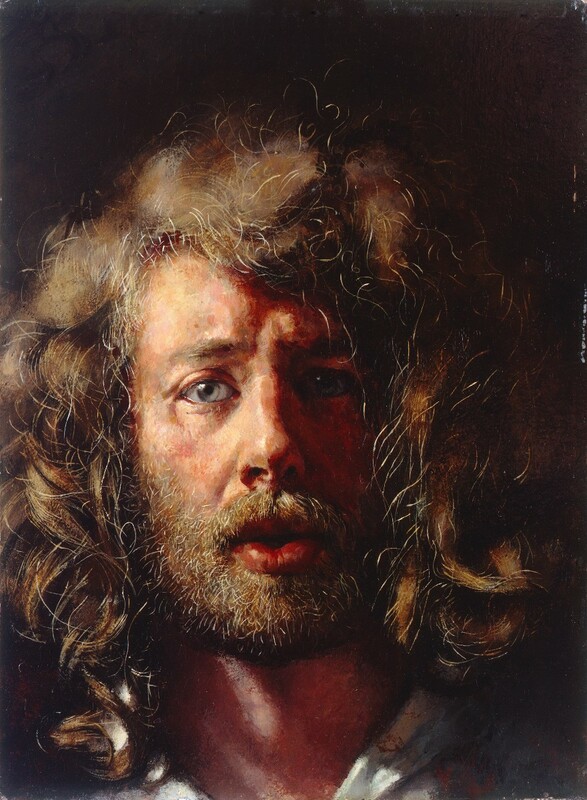 With the first official biography of painter Robert Lenkiewicz (1941-2002) in preparation, Green Hill Arts presents an exhibition of works marking the most significant waypoints, both painterly and biographical, in Lenkiewicz’s career. Curated by The Lenkiewicz Foundation, each work has been chosen to show the development of Lenkiewicz’s style and subject matter through the years, but also to place him at key moments in the remarkably colourful life. Showing diary notes, preparatory sketches, and finished canvasses, this show intends to provide a thought-provoking insight into the ideas and inspiration behind his work and reveal a side of the artist’s creativity that is seldom seen. The works are drawn chiefly from the collection of The Lenkiewicz Foundation, together with works on loan to the exhibition. The first official biography of Robert Lenkiewicz is under preparation and author Dr Mark Price will be giving a presentation of this work in progress. The illustrated talk will draw upon research in Lenkiewicz’ personal diaries, together with hundreds of hours of interviews with family, friends and companions of the artist. 188 x 203 cm. Oil on canvas. 97 x 146 cm. Oil on sail cloth. Restored fragment. Charles Thomas McNaughton. 1976 42 x 29 cm. Pen on paper. 84 x 77 cm. Emulsion on prepared plaster. 51 x 45 cm. Oil on canvas. 29 x 24 cm. Cryla on wood panel. 40 x 28 cm. Cryla on board. 85 x 63 cm. Oil on canvas. 64 x 76 cm. Cryla on canvas board. 41 x 28 cm. Aesthetic Note. Watercolour and bodycolour. 41 x 51 cm. Aesthetic Note. Watercolour and bodycolour on paper. 56 x 64 cm. Oil on board. 42 x 30 cm. Mixed media on paper. 38 x 53 cm. Aesthetic Note. Mixed media. 41 x 41 cm. Aesthetic Note. Mixed media. 84 x 66 cm. Cryla on paper laid on board. 51 x 42 cm. Aesthetic Note. Pen, ink and watercolour. 180 x 122 cm. Oil on canvas. 46 x 58 cm. Oil on board. Beech tree in the Painter's garden, Lower Compton (with Anna's lily). 27 x 59 cm. Oil on board. ‘I think of Artaud’s rage against organs’. 11.35pm. 24 September – Thursday, 1998. 27 x 22 cm. Mixed media. 3 diaries from 1978, 1979 and 1981 shown in display case. SUBSCRIBE TO OUR NEWSLETTER - Keep up-to-date with exhibitions, news and events.